They are an industrious, friendly and pleasant couple.They are the visionaries of the four year old dream come true project named Abundant Harvest, which has started to bloom and bear fruits on their leased out farm land. The cute farm house is named after the two towering red wood trees that stand in the background giving DOS SEQUOIS a fairy tale house look. Meet STEVE AND MISHELLE RADTKE. Their Abundant Harvest is a Community Supported Agriculture (C S A) subscription farm and they offer shares in Portland metro area. The subscription made early in the season goes towards purchase of seeds and other initial costs. The months beginning from May to October are peak season when mother earth yields a bountiful harvest, which is shared and enjoyed by all the shareholders. Every Wednesday we drive past the city of Hillsboro, past the wheat fields and past a few other farms and arrive at a gate, where we encounter a board that says, “The Abundant Harvest Family welcomes you”. We enter the gate and drive along the mud path lined by short and lush trees thronging with peaches, apples and plums, and park in front of the dream house, not missing to take a look at the healthy corn fields on our far right. Mish beams and nods as she cuts her equally beaming bright fresh flowers from the wild, informal garden. Steve emerges out of the herbs and the vegetable patch and waves out to us with a big smile. We enjoy the warm welcome as we reciprocate, and walk into a shed where the abundant harvest of the week awaits us. We sign in and look at the board, which notifies us about the variety of vegetables, harvested on that day and the amount of the produce that each shareholder is entitled to take. There are an assortment of lettuce, spinach, chard, zucchinis, summer squashes, cucumbers, carrots, beets, Walla Walla onions, garlic and herbs like Italian parsley, Genovese and lemon basils, kohlrabies, cabbages, sweet corn and tomatillas - all of them fresh from the womb of mother earth, washed and wiped, looking bright as new born babies in their baskets. We count or weigh and pick up our share while the flavour of the fresh herbs fills our nostrils. We walk out with the heavy bags to the gazebo where Mishelle has laid out the fresh cherry tomatoes, plums, wild plums, cherries and blue berries in pint measures and basketsful of big salad tomatoes on long wooden tables. A variety of cut flowers greet us with their myriad colours as they stand tall in a bucket of water. Mishelle’s flowers are “Food for the soul”. That is what the flier says. It also includes the latest farm news, farm requirements if any and two or three recipes. We eagerly look forward for Wednesdays and a visit to Abundant Harvest to enjoy the scenic beauty and also to pick up the most fresh vegetables grown most naturally without ravaging mother earth with pesticides, herbicides and fertilizers. Wish you all the best Mishelle and Steve. You provide food for the body, soul and for the thought as well. Thank you for that, and also for tugging us down close to mother earth at least once a week in the middle of all our other ‘hi- tech’ activities. I love the cherry tomatoes in all their hues – red, orange, yellow, purple! I am really carried away by their colours and taste and hence, every day they sneak into my sambars or float on rasams and peek-a-boo in my salads. A plain paruppu looks and tastes great when the cherry tomatoes lend their charm to it. 1.Cook dal in 2.5 cups of water and turmeric powder in a pressure cooker. 2. Mash dal well to a gravy consistency and add salt. 3. Heat oil in a small seasoning ladle and add the mustard seeds. 4. When it splutters add asafetida and chopped green chillies. 5. Add the seasoning to the dal. 6. Slide the cherry tomatoes whole (Cut the big ones into halves) into the dal. 7. Stir covered with a lid and simmers it for two minutes. 8. Add chopped coriander leaves. 9. Enjoy with chapaties or rice with a blob of butter and a squeeze of lime for the tang. Footnotes by Tara:If you are unfamiliar with tur dal, substitute with yellow split peas. 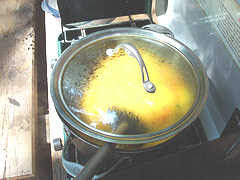 Also, if you do not have a pressure cooker you can soak and boil the yellow split peas until they are soft and mashable. Some delicious Soup and Pasta prepared by my daughter-in-law Tara, with the produce from Abundant Harvest. 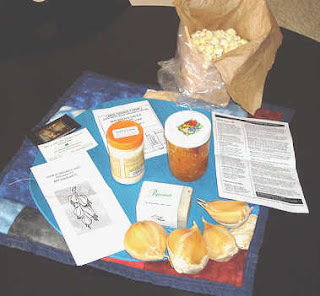 A mail on Elephant Garlic Festival and a Medicinal (Stinky!) Garlic Payasam! Don’t you love long juicy mails? We hardly get long letters like this, these days! Here is what I got from Chitra Amma yesterday, and I was very tempted to share it given the topic! I have edited names etc for obvious reasons, and provided some translations! Portland seems to be a land of plenty. People here are very relaxed, friendly and they take time to concentrate on issues like conservation of greenery, eco friendly activities, minimizing pollution, growing organic food, encouraging home gardening not only for aesthetic reasons but also to protect and enhance birds and other small animal life. A big NO to fertilizers and pesticides. Of course the Pacific Wild West is the biggest asset providing them with an extremely fertile virgin soil. A half an hour drive from home in any direction leads us to the vast bountiful landscapes consisting of golden wheat fields, orchards, farms, land growing flowers and even Christmas trees with the mountain ranges lining the horizon. Like we say children and God are present in kondadum idathillae (where they are celebrated), the farmers here do kondadafy (celebrate) each and every produce as it is harvested every year. The festive spirit and the happiness they spread through their bounty harvest only reminds me of SriSri Ravishankar and Sukhabodhananda who eternally stress on ‘celebrating life’ through their speeches. There was a lavender festival a fortnight ago. Last week end an Elephant Garlic Festival (called Fun Stinks!!!) was celebrated. We visited the festival grounds after collecting our customary coffee and chocolate chip cookies from Starbucks in about thirty minutes. There was a buggy at the entrance waiting to give us a lift to the grounds. By the time I could sit back, the driver said “There we are”, and we really felt foolish to have taken the buggy for such a short drive. The big banner announcing the Elephant Garlic Festival fluttered to welcome us. There were stalls and stalls selling fresh garlic each the size of a big mosambi (sweet lime). Some stalls had braided them into garlands for display and there were garlic flowers arranged in vases. 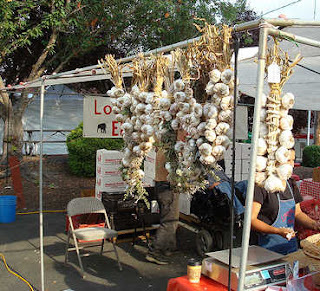 The ingenious farmers also sold various garlic preparations, which could be used for cooking. Garlic powdered with a variety of spices in various combinations were sold in small bottles which could be used for garnishing soups, for making various dips, or for dressing salads. A photo-shy old lady had displayed yummy jams prepared out of mango, cherry, plum strawberry, blueberry and many other fruits. A lick of the jam was offered to us in tiny disposable spoons for sampling. They did taste yummy at first, but left us gaping with the startling flavour of garlic which was laced in it in the end. 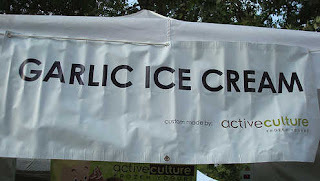 We had a similar experience when we tasted the garlic – Please believe me - ICE CREAM! We bought only one cup and after we tasted it our faces contorted involuntarily, leaving poor A (Chitra Amma’s son) to finish up the whole cup. Three cheers to A’s DON’T WASTE policy! I did not trust him at all when he said ‘Not bad. Nannadan irukku’! (Not Bad. Its quite nice) I was reminded of M Sitti’s (an old aunt) story which Amma had narrated so many times, of how she prepared poondu payasam for her bananthi (pregnant) daughter, in a charcoal choola in the bathroom of all places, and how she made her daughter drink it soon after her oil bath – in the bath room itself- all to avoid evil eyes! Popcorns with Garlic and Parmesan cheese were good. They also sold a dish with garlic cheese and potatoes which we did not try, and many other meat preparations. 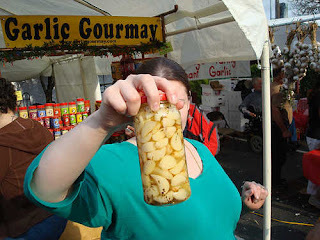 There were many stalls selling garlic pickles, some preserved in vinegar some in lime with a variety of spices, barring our lip smacking chilly powder and oil. There were stalls selling herbal bath soaps which were really aromatic- lavender, lemon, peppermint, apple cedar etc etc and they were prescribed for various skin problems. The rest of them were all arts and crafts material – garden crafts to install in gardens, models and candles made out of bee wax. 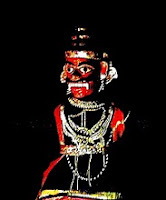 Remember Amma used to make them and she had once exhibited them in the Dasara exhibition? Beads and trinkets, Tshirts; there was a place for kids where they could jump and bounce on inflated platforms, an artificial post for ‘mountain climbing’ and ‘rappelling’. On the whole it was like the Dasara exhibition on a smaller scale. Carrying a few things that T (Chitra Amma’s Daugther-in-law) bought – a jam bottle, a peppermint soap, a bottle of seasoning, the half empty pop corn packet, the four garlic pods we got as samples (one pod was the size of one whole garlic we get back at Blore), and a strong aroma(!) of garlic in our mouths - we drove towards The Queen Of Sheeba for a sumptuous dinner. The dinner for the whole family in one big plate included three large injeeras (two extra injeeras were also ordered) served with a dozen vegetable and lentil samples. We tried to wash away the garlic smell with a hot glass of ginger tea before dinner arrived. We relished the Ethiopian dinner listening to the soft drone of an Ethiopian song, which sounded unmistakably like the yesteryear songs of Thyagaraja Bagavatar! That is all the news for this week! All well here. Rest in my next weekly. Best wishes and love to aaaaaaall at home, Chitra. I insisted that Amma give me the recipe of that terrible sounding garlic payasam! "It is traditional, and therefore finds place in our blog" was my argument. She has reluctantly shared it – with all warnings! 1. Cook the fresh, raw, garlic pods and roasted semolina in milk on low fire. 2. When the pods are well cooked and mashable, and when the milk becomes creamy remove from fire. 3. Add saffron and sugar and serve while still hot. You can try out this payasam if you are a garlic buff or if you are an adventurous person! It is supposed to keep banantis (new moms) warm and ward off cold. It induces good appetite and promotes good digestion. I personally feel a dash of pepper and salt instead of sugar, will turn the dish into a creamy garlic soup which would be more relished than the sweet payasam! All of us enjoy garlic in rasam though and here is the link for the poondu rasam recipe. Happy moments when shared with near and dear ones doubles ones joy. It becomes threefold when it is shared along with a delicious treat. I am currently in Beaverton, Portland, visiting my son and daughter-in-law. A simple Mysorean way of sharing happiness is by giving an S K C treat to the dear ones. S K C stands for Sweet-Khara (savoury)- Coffee. Though there are a great variety of sweets and savouries to be picked from, the most commonly preferred dishes are the kharabath and kesaribath which are delicious, filling and simple to prepare as well. These twin dishes – one sweet and the other spicy, both prepared out of semolina – are together referred to as Chow-Chow bath. 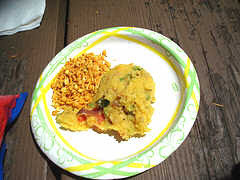 When the question arose as to what dish was to be prepared during our picnic, it was unanimously decided that we would prepare kharabath as it was quick to cook. The preparations went on with full swing on the eve of our great outing. Camp chairs, Camp stove, and all other picnic paraphernalia were compactly packed. On the kitchen side my daughter-in-law had prepared a cucumber and tomato thair pachadi and had left it in the refrigerator. An instant home made kharabath mix was prepared and stored in an air tight box. The next morning after a plain toast and coffee breakfast we set off towards the awesome picnic spot – The Trillium Lake. 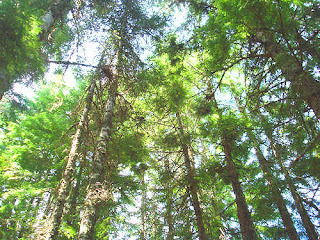 It was an 80 mile drive from Beaverton via small places which had names like Welch, Sandy, Boring, Rhododendron, Zig Zag, and even Madras!! Finally we arrived at the lake with all our cooking paraphernalia compactly packed in two bags only. We parked the car and walked through one of the many trails which took us to the edge of the lake. And lo! What a sight! Trillium Lake is a vast lake surrounded on three sides by a thick emerald jungle with sky scraping trees called Doglus Fir Trees. 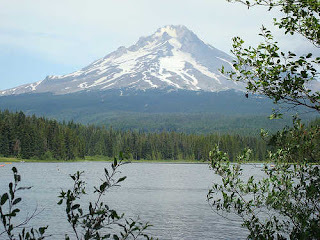 As the ripples in the lake welcomed us with a cool breeze, bang stood the magnificent Mt.Hood on the opposite side of the lake staring at us with all its grandeur. 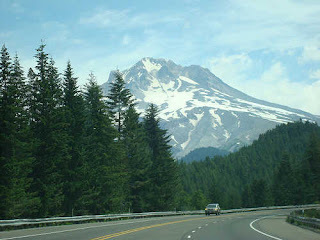 Mt.Hood is one of the many dormant volcanoes which belong to the Cascade mountain ranges lining the west coast of the United States. The magnificent mountain looks like a symmetrical triangle when viewed from any side. The 13000 ft of awe is visible from Beaverton as well, as a solid pure white triangle or pyramid because it is thickly blanketed with snow most of the time. 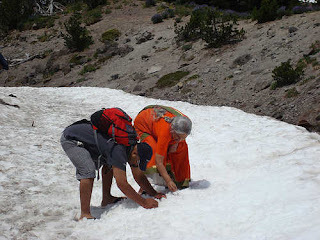 We wondered at the colourful painting like scene, and immediately chided ourselves for having compared the Great Creator’s canvas to a mere picture post card! The forest was dotted with wooden tables and benches for the visitors to relax and enjoy their meal viewing the lake at the same time. There were hundreds of visitors thronging the place but there was pin drop silence everywhere. Old men sat on the edge of the lake relaxing on their camp chairs with their fishing rods. Many families with kids and even pets were sitting and enjoying their lunch. Many of them had brought along their fiberglass boats which were tied on to the roof carriers of their cars. Others had their colourful inflatable boats, and children played with floats in weird shapes like huge crabs and whales. On the whole it looked as if a colourful mela was going on in the lake. 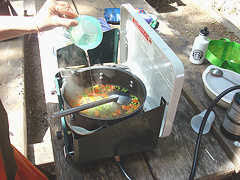 My daughter-in-law lit the camp stove we had carried along, and water was boiled in a thick walled vessel. 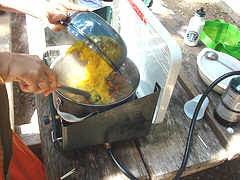 Our home-made instant kharabath mix was stirred in and our lunch was getting ready. Haldiram’s instant Bhel puri was prepared as well. 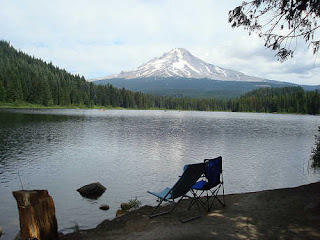 In about fifteen minutes time lunch was set on the log table under the cool dark shades of the tall fir trees overlooking the tranquil waters of the Trillium Lake. 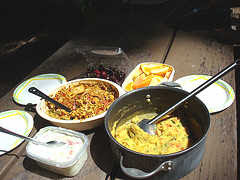 We enjoyed Kharabath, raitha, bhelpuri, mixture and finished off with juicy cherries, wedges of oranges and apples. Our lunch had never tasted so heavenly before! We rested at The Timberline Lodge - a stone and timber structure built in the 1800s. There is a big circular fire place in the middle of the lounge and the whole set up looked like Mogambo’s den! We finished our trip with the C of S K C and had a comfortable and contented journey towards home. 1. Heat oil in a pan and add mustard seeds. 2. 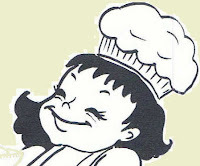 When mustard splutters, add black gram dal and roast until golden in colour. 3. Add chopped green chillies, ginger, onion and curry leaves and sautee until onion becomes golden in colour. Make sure there is no moisture. 4. Add turmeric powder and stir. 5. Add semolina and roast till you get a pleasant aroma. 7. Cool thoroughly and store in an air tight box. Note: Since we made the kharabath mix just the previous night, and the mixture was completely dry there was no problem. I feel we can make the kharabath mix in bulk and store it in an airtight container. It can easily last for a week – perhaps more when stored in the refrigerator. It can come in very handy for a quick breakfast anytime! Tomatoes - 2 or 3 medium size. Chop the tomatoes and freeze with peas in a small box overnight. 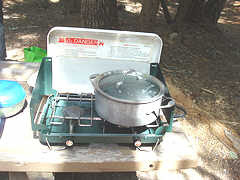 1.Heat three glasses of water in a pan on the camp stove. 2. Add chopped tomatoes and peas. 3. 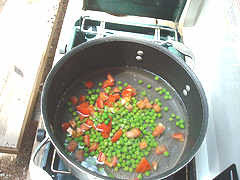 Add the oil and cook till the tomatoes and peas become soft. 4.Add the previously prepared kharabath ready mix. 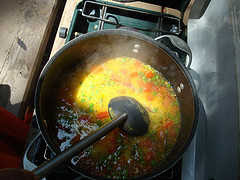 5.Cover with lid and cook until done. 6. 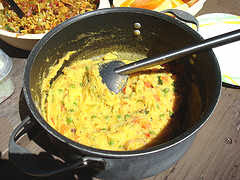 Set kharabath among the other dishes. 7. My son liked the kharabath with a crunchy mixture and 'ready raita'. Note from Dibs: Never try making a blog post with so many snaps!! "Compose" and "Preview" NEVER match. But I am done with this post ..phew!! !